Prime Minister Binyamin Netanyahu vowed Monday morning to “respond forcefully” to a rocket attack on central Israel overnight that left seven people injured. Speaking from Washington ahead of a meeting with President Donald Trump on Monday, Netanyahu said he had been updated by telephone regarding Israel’s security situation, and was preparing to return home early. 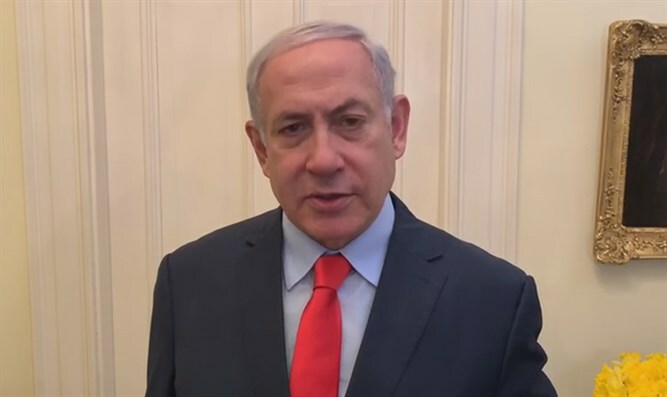 Netanyahu had been scheduled to address the 2019 American Israel Public Affairs Committee (AIPAC) conference in Washington on Tuesday, but cancelled his appearance following the rocket attack. The New Right faction of Education Minister Naftali Bennett and Justice Minister Ayelet Shaked issued a statement Monday morning, lamenting the ‘collapse’ of Israel’s deterrence, claiming that Prime Minister Netanyahu “has failed against Hamas”. During the attack early Monday morning, at least one rocket landed in the Sharon region in central Israel, hitting a home in the Moshav Mishmeret. A 60-year-old woman was wounded by shrapnel and suffering burns from the rocket’s explosion, leaving her in moderate condition. A 30-year-old woman is also said to be in moderate condition after suffering shrapnel wounds. Five others are listed in light condition.